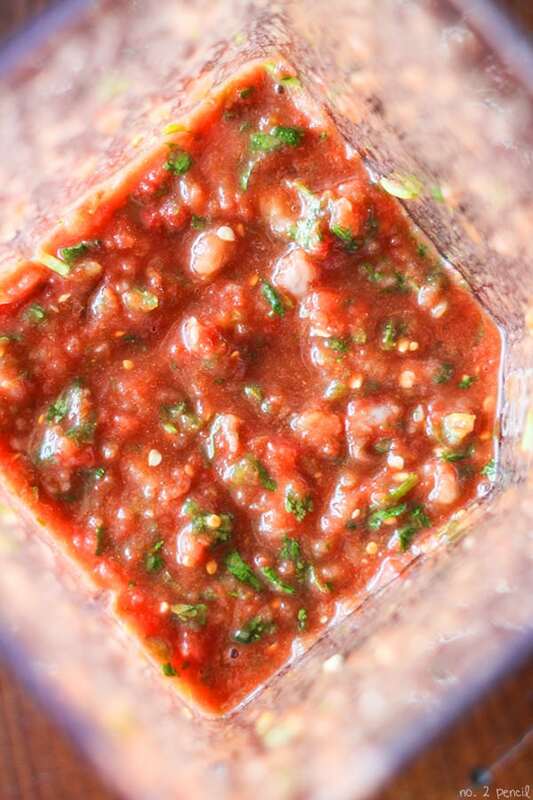 This chunky blender salsa takes just minutes to make, and is really so addicting. 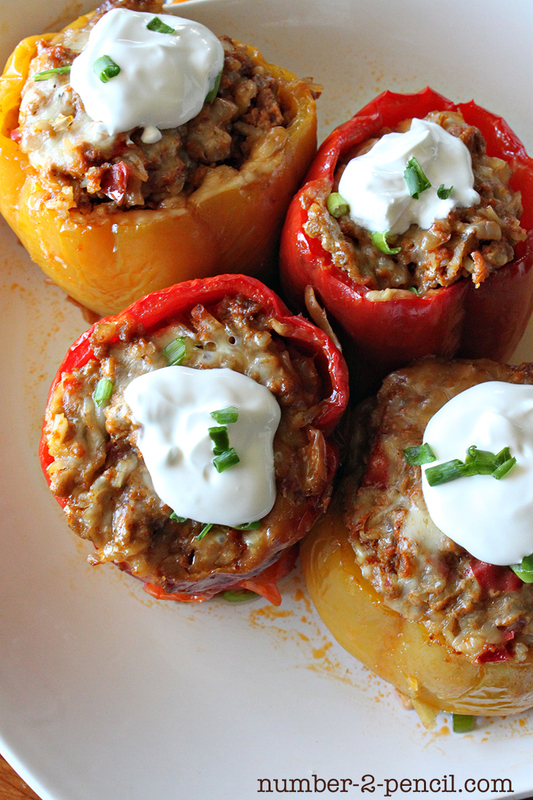 I kept this recipe chunky and loaded with onions, jalapeño, tomatoes and fresh cilantro. It’s perfect for dunking tortillas chips, piling on a taco or adding to a breakfast burrito. 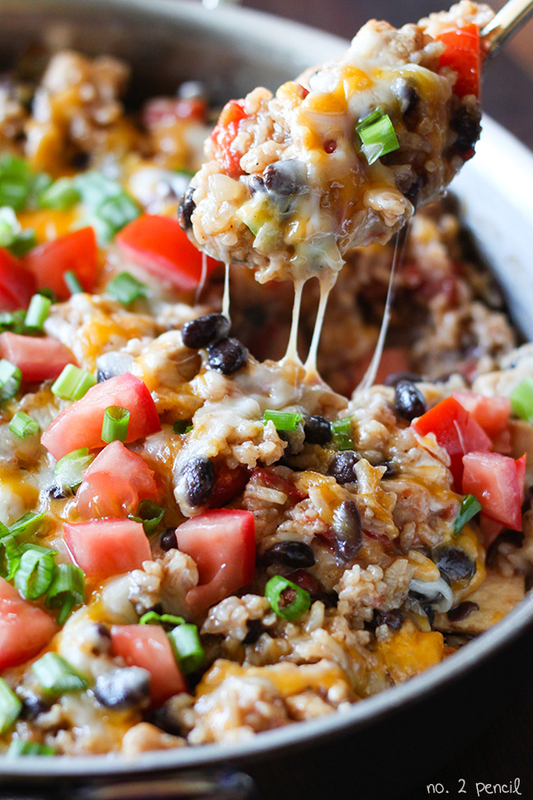 Make this on the weekend, and snack on it throughout the week! A few weeks ago, I had the opportunity to review a Blendtec Designer 725 blender and let me just say that I’m in love. I had no idea how often I would use it. In fact, it has a permanent place on our counter because I’m using it daily! It’s really a surprising multi-tasking kitchen tool and I can’t wait to share some of the recipes I’ve been working on with it. One of my favorite parts of the Blendtec Designer 725 is that it’s fun to use. It keeps track of your blends and gives you encouraging messages. It’s the smartest appliance I’ve ever used! The other one of my favorite features is the cleaning preset. Add a cup or two of hot water and a drop of soap and hit the clean button. It washes the blender out for you! I was so excited to try out the Blendtec Designer 725, and I’m even more excited to be offering one as a giveaway to a lucky reader! Just follow the Rafflecopter prompts at the end of the post to be entered to win! Ok, back to the salsa! Just throw all the ingredients in, starting with the tomatoes and lime juice. Start with the liquid at the bottom of the blender for the best blending. In order to keep the salsa chunky, I gave the onion just a rough chop in half so i didn’t have to over blend the salsa. Just give a few pulses so it stays chunky. 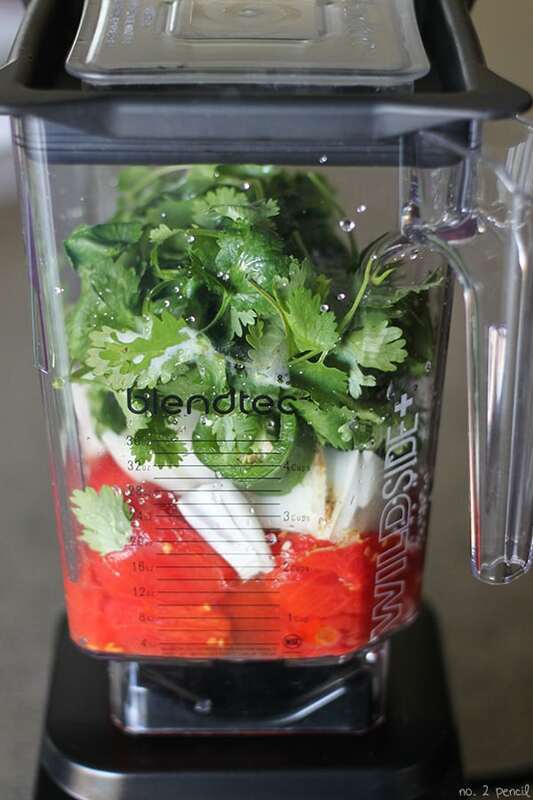 If you are using a powerful blender like the Blendtec, it only takes seconds to get the right consistency. 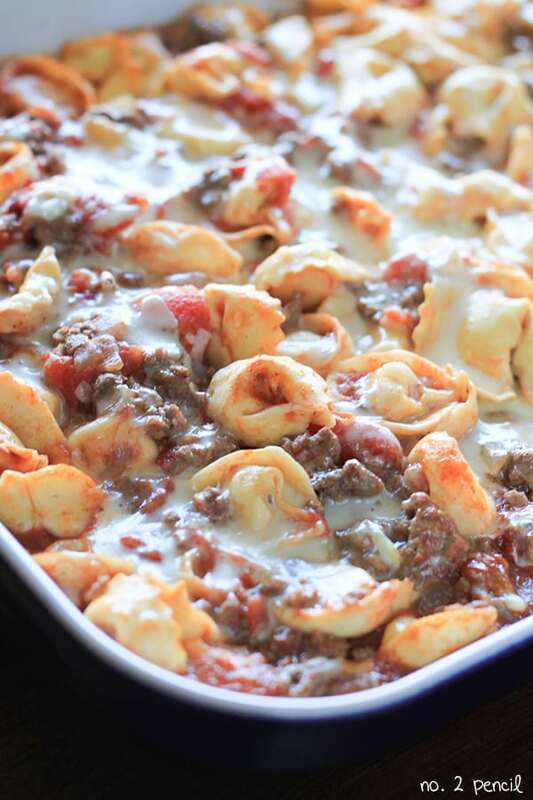 See, perfectly chunky and delicious. I just can’t get enough of the fresh taste of homemade salsa! Start with tomatoes and lime juice at the bottom, and add remaining ingredients on top. Pulse just until salsa reaches a chunky consistency. Adapted from my homemade salsa recipe. Sweet potato pie….um um good. I’m so eager to try your salsa recipe! I’d make the very recipe for the yummy chunky salsa on tonight’s post! Hmmmm, up what would I make? I would make a roasted vegetable soup~ you purée at the end and add a bit of cream. God, that salsa looks delicious, so probably the salsa!!! gteat giveaway! I’d make smoothies and green juice! That salsa looks fantastic. If I win the blender, I would make that salsa ASAP! that salsa recipe looks great but I am a smoothie girl so I would make a green smoothie. Yesterday I tasted some homemade celery seed salad dressing. Tthat’s the first thing I would try. The dressing was awesome! I would love to try to make soup. And also try to make the salsa. I’d totally make this salsa!!! I love making homemade salsa. 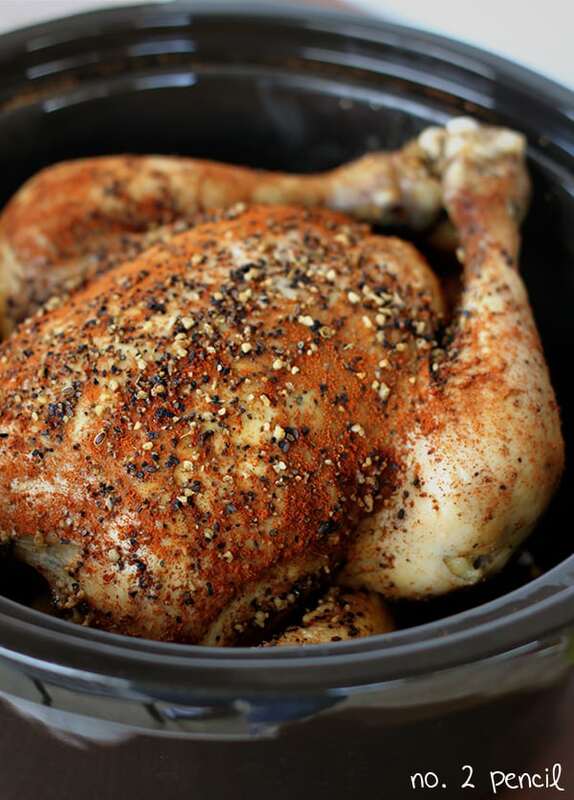 I will be trying this recipe nexy time. I make smoothies all the time with my current blender, so I would try some of that salsa, to spice things up! 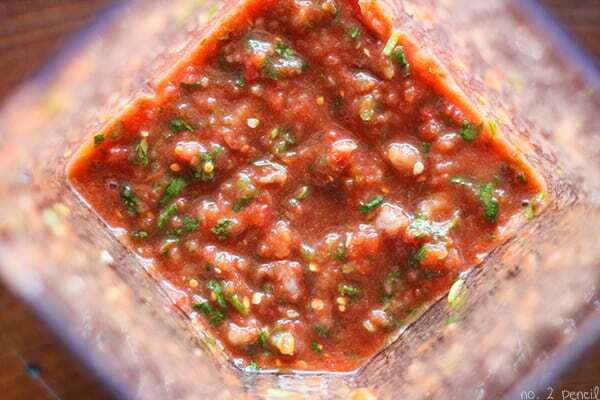 I really want to start taking better care of myself and eating better so I would like to try a green smoothie but boy does your salsa look amazing! I would make this recipe as my first made in my new Blendtec 😉 ! great blender…would LOVE to have one! I love to make low carb protein shakes, but it’s difficult to get it smooth in a regular blender. I bet this would make an awesomely creamy drink! I looked at one of these online, and I didn’t realize what they were all about! If I had one of these I would make my mother-in-law’s pecan pie. All of the ingredients are put into a blender / food processor. I haven’t had either since our house fire in 2008. Fortunately, she makes a pie for me when I am wanting it bad enough to ask. Thank you for sharing – someone is going to be thrilled with this amazing prize just before the holidays! 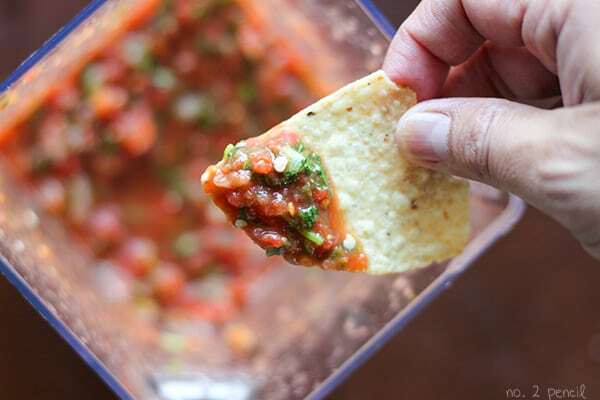 What a great idea, using a blender to take away the mess and effort of making fresh salsa! Thanks for sharing with us! If I win my first blend would either be some really good salsa like yours or some cream of broccoli soup. Thanks! This looks insanely good! I’d use the blender for just about anything! Smoothies, sauces, dips! I would make smoothies, salsa, soups, etc! I would make chocolate shakes with candy bars added in. I have been following you for ages and I’m super excited to try this salsa recipe! My bf is a salsa addict! Let’s see if he approves! DEFINITELY this salsa, girl! YUMMO! I would definitely do a smoothie!!! But the salsa looks amazing. I’ve never even DREAMED of trying to make my own. Now I gotta try it!!! My kids ask for smoothies almost every day, so definitely that! Smoothie, for sure! My 10 yr old son is a smoothie freak! My SIL makes the best hummus using her blender. I’d like to give it a shot! I would definitely make salsa! I would blend my daughters food so it can go down her gtube!!! Frozen fruit smoothies. Or salsa. Or a milkshake. Probably all of the above 🙂 Thank you! Smoothie!! I make them daily, but my blender is on its last leg!!! I would make a smoothie for my husband and kids first. I was originally thinking smoothie until I saw this recipe. Salsa!!! I would definitely be making soup. I’ll need to prepare for the long winter ahead! If I won this blender, I would make your salsa recipe then wash out the blender and start on the margaritas. My daughter wants salsa year round so i would definitely try this! I also have a Ginger Carrot Soup recipe that this would be perfect for! Yum! Oh my GOSH! I’d try your salsa recipe first! Then, some healthy smoothies! Salsa is the bomb!! 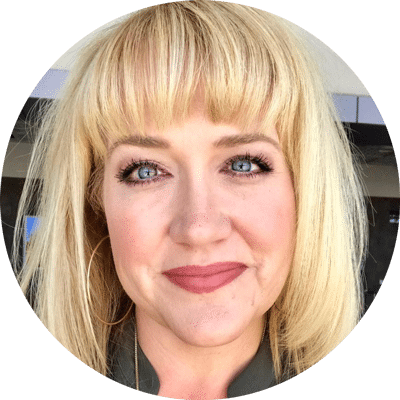 I grew up in LA and moved to San Diego when I was 20…I’m in my 50s now. I have had ALOT of salsa in my day, as Mexican food is my favorite cuisine. Sounds delicious! Thanks for sharing!!! !